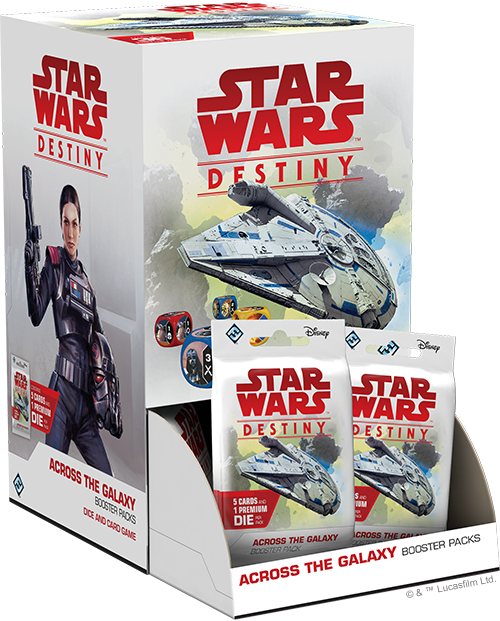 Order your own boosters of Across the Galaxy at your local retailer or online through our website today! The Millennium Falcon, the fastest ship in the galaxy. Through generations, this ship has been the home to some of the most prolific heroes in the Star Wars galaxy—perhaps most notably, the smuggler Han Solo and his loyal co-pilot, Chewbacca. But this ship has a history, and before this pair made their way across the galaxy, the Falcon belonged to Lando Calrissian, and in pristine condition took Han on his very first galaxy-spanning adventure. 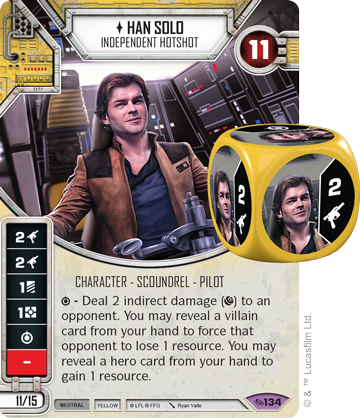 Join us today as we preview characters from Solo: A Star Wars Story as they appear Across the Galaxy, a new set of boosters for Star Wars™: Destiny! 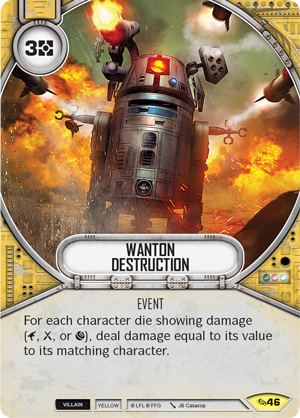 Across the Galaxy features 160 cards from every era of the Star Wars saga. Look for plots with negative point values, cards that look to spot some of the most iconic Star Wars characters, and modifications for famous vehicles to take you across the galaxy. One of the most famous vehicles found in Across the Galaxy is the Millennium Falcon (Across the Galaxy, 103), the fastest ship in the galaxy. 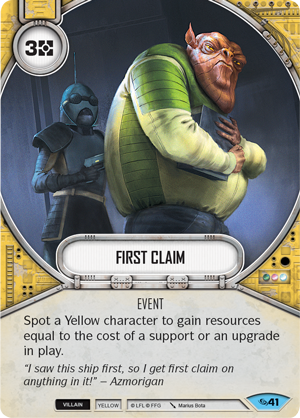 While previous versions in Star Wars: Destiny portray the YT-1300 Freighter as an aging hunk of junk, it joins Across the Galaxy in its prime. 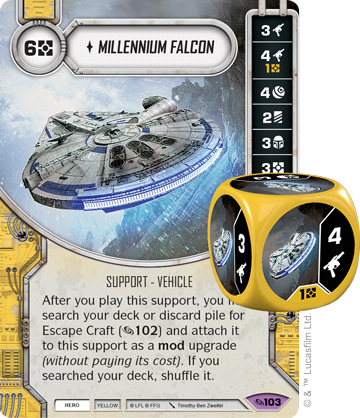 While a six-cost support is a massive investment, the Falcon allows you to search your deck and discard pile for an Escape Craft (Across the Galaxy, 102) and attach it as a mod upgrade, essentially giving you two dice with a significant discount on the Escape Craft. 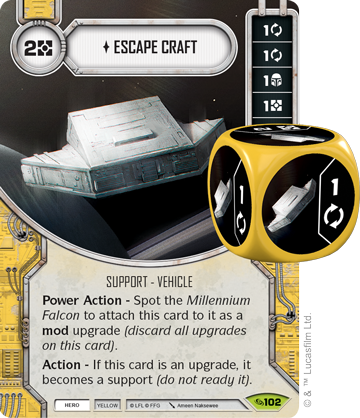 With no blank sides and its lowest value showing a two, the Falcon will quickly return your investment in the form of resources and damage, and the Escape Craft can make the Falcon even more reliable with its focus symbols. Sleek and stylish, the Falcon reflects the aura of its owner, Lando Calrissian (Across the Galaxy, 89). 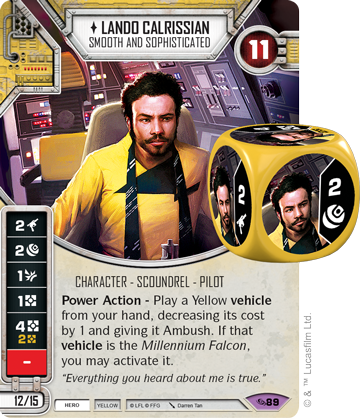 In fact, the two are a natural fit—Lando’s Power Action lets you play a Yellow vehicle from your hand at a discounted cost with ambush, and immediately roll it out if it is the Millennium Falcon. 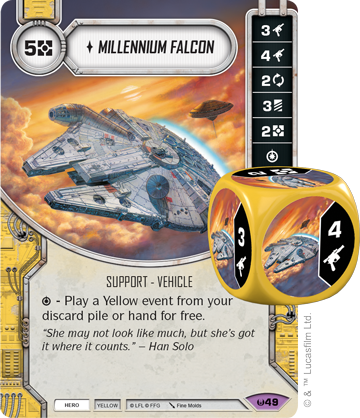 This of course works with the Awakenings (Awakenings, 49) and Legacies (Legacies, 52) Falcons, but the version found in Across the Galaxy comes with the greatest advantage, letting you attach the Escape Craft before you roll out the support. 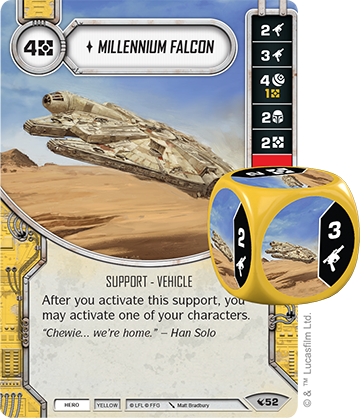 Though it's an expensive venture, playing the Falcon allows you to roll out multiple dice and still have an action left to resolve them. In the same way Chewbacca has been loyal to Han Solo, L3-37 (Across the Galaxy, 91) faithfully co-pilots the Falcon with Lando. 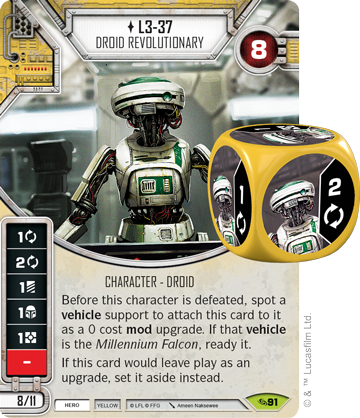 As a droid, L3-37 has one of the most unique abilities in the game, able to attach herself as a mod to a vehicle after she is defeated. If that vehicle is the Millennium Falcon, you can also ready it! Characters like Obi-Wan Kenobi (Spirit of Rebellion, 37) have previously given you a benefit upon defeat, but L3-37 will stay relevant throughout the entire game, so long as you have a vehicle to attach her to. The edges of the galaxy are no place for morality. Those on the lower rung of society have to do whatever it takes to survive—whether those actions can be considered heroic or villainous matters little. 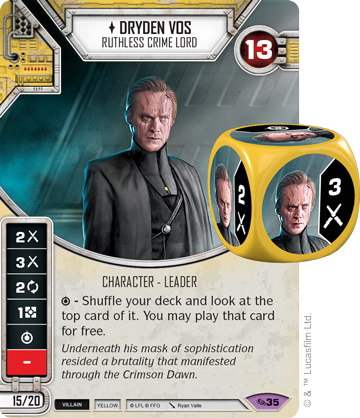 Qi'ra (Across the Galaxy, 135) is one of these morally-nebulous scoundrels entering the game as a neutral character, at thirteen points for a normal version or sixteen for an elite. 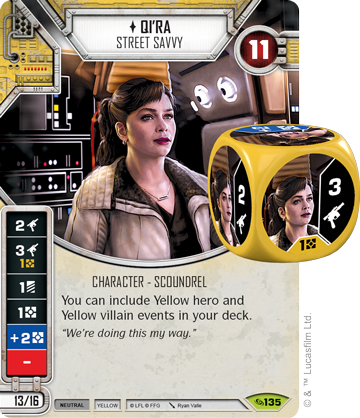 With the ability to include Yellow hero and Yellow villain events in your deck, Qi’ra would be the perfect companion to Han Solo (Across the Galaxy, 134) if their elite versions didn’t add up to 31 points. Luckily, if they are truly willing to commit to the life of the scoundrel, there may still be a way to work together. 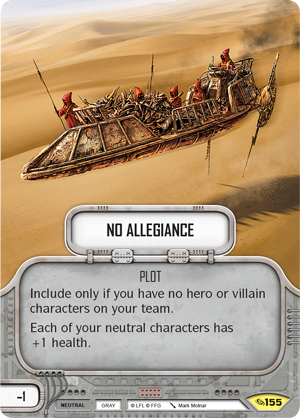 No Allegiance (Across the Galaxy, 155) is a plot worth -1 point, allowing you to create teams with a total cost of 31 points… at the restriction of having no hero or villain characters on your team! While this is a massive drawback, No Allegiance also gives your neutral characters additional health, and if one of those characters is Qi’ra, your event options are far from limited. When she is partnered with an elite Han Solo, you have the rare opportunity to use both versions of his special ability. Disregard morality entirely and you may find yourself on top of a criminal empire, where resources are plentiful. 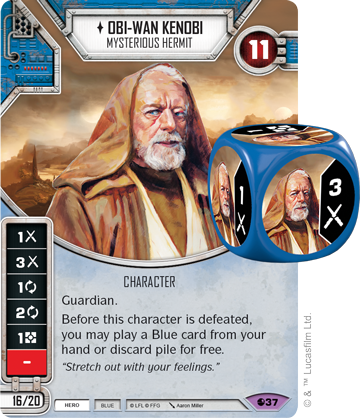 Dryden Vos (Across the Galaxy, 35) is fifteen points for a normal version or twenty for an elite. While he can dish out melee damage readily, his true strength comes from his special symbol, which lets you shuffle your deck, reveal the top card, and play it for free. Scum and scoundrels are skilled at taking what they can get and making the best of it. There is no reward without risk, but a carefully crafted deck can ensure Dryden Vos always finds success with his special ability. For example, perhaps Dryden, in desperation, flips Wanton Destruction (Across the Galaxy, 46) with his special ability. Dryden will be offered some protection, as one of his dice was used to activate the special. Your opponent may not be so lucky, and this is just one of the tricks Dryden will have at his disposal when trying to get out of a jam. Perhaps you'll flip First Claim (Across the Galaxy, 41), a normally spendy investment that’s sure to make you a profit if revealed by Dryden. Regardless of the whims of fate, Dryden Vos always has one last trick up his sleeve. Few are as well-equipped as scoundrels to travel across the galaxy. Whether they’re just trying to survive another day or they're running a criminal empire, those who live on the fringes know the deepest secrets of the Star Wars galaxy, and how to make a profit along the way. 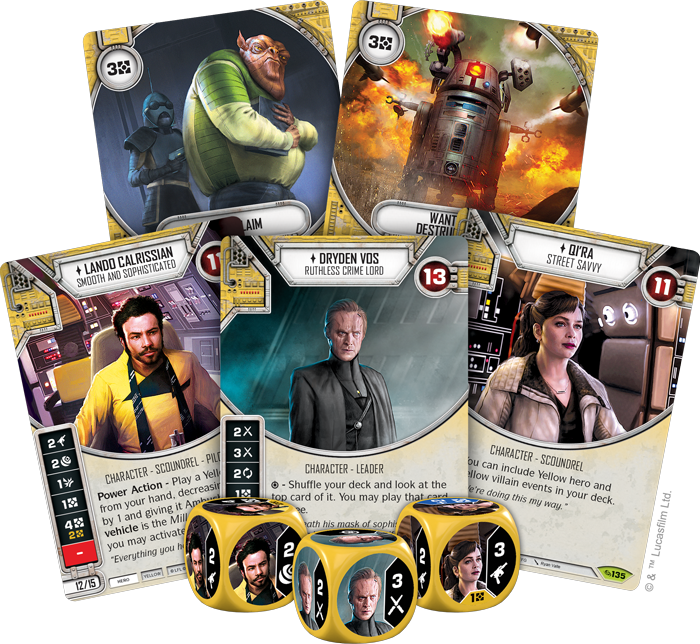 Throw your lot in with scoundrels and scum in Across the Galaxy (SWD13), available now for pre-order from your local retailer or our website!